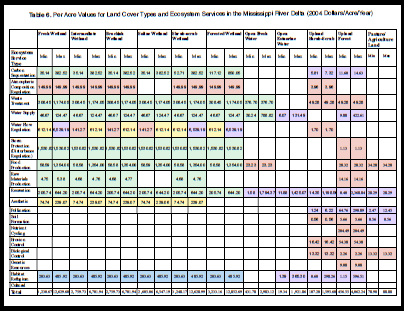 omic value of different land cover types, based on the ecosystem services that each provides. Values have collected from the scientific literature, and are currently housed in an Earth Economics database. See the full report. The Wild Salmon Center release of "The Value of the Kol River Salmon Refuge's Ecosystem Services" represents the culmination of more than six months of work in partnership with the University of Vermont Gund Institute. This study is the first attempt to approximate the total flow of ecosystem services in a healthy wild salmon ecosystem. This study was conducted in the Kol salmon refuge, a whole basin Protected Area in Kamchatka, Russia created by partners with the support of the Wild Salmon Center. The report asks the question: What is the economic value to society to preserve a pristine salmon ecosystem like the Kol River Salmon Refuge? The Kamchatka Peninsula, in the Russian Far East, is home to one of the most productive salmon strongholds on earth but it faces a number of threats from development of nonrenewable resources (e.g. minerals, oil and gas). This development path may provide short-term economic benefits, but may also sacrifice the long-term economic productivity of a salmon ecosystem. Ecosystem services, on the other hand, represent a collection of renewable resources and processes that are supplied by natural ecosystems and can provide long-term economic benefits to human populations at local, regional and global scales. Benefits include market and non-market services such as clean water, biodiversity preservation, food production and recreation. The Intergovernmental Panel on Climate Change (IPCC) (2007) reports a likely 2°C to 4.5°C temperature rise in the upcoming decades. This warming is likely to affect ecosystems and their ability to provide services that benefit human well-being. Ecosystem services valuation (ESV), meanwhile, has emerged as a way to recognize the economic value embodied in these services that is not currently reflected in markets. To contribute to better understanding of, and therefore decision-making regarding, the costs and benefits of climate change, other measures affecting the management of the wilderness and other public lands where many ecosystem services are harbored or produced in abundance. We combine GIS analysis with the benefits transfer method to estimate potential global-warming-induced changes in the economic value of ecosystem services produced by US conservation lands. Using conservative assumptions, the overall trend indicates that the majority of ecosystem services values decreases as temperature increases. While some ecosystem service values increase in the 2° scenario in several regions, the values markedly decreased in all but one region under the 4.5° scenario. These results are consistent with other major studies such as the IPCC and the Cost of Policy Inaction and indicate both the important role of public conservation lands in providing ecosystem services and the need for policy action to avoid major economic losses were climate change to impair the health of those lands. See full report.